Facilitates fast, convenient and containment free grease gun refill – up to 50cc per stroke. 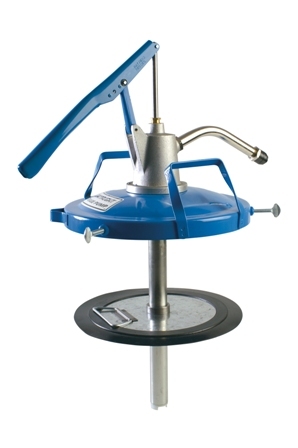 Reduces your per kilo grease price by buying your grease in 20kg drums. Can be used in conjunction with Australian, European and US manufactured grease guns. High quality follower plate eliminates air pocket problems. 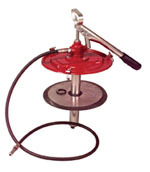 An economical solution for relling most standard grease gunsusing larger grease pails from 12.5 kg (28 lbs) up to 22 kg. 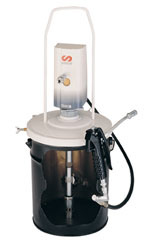 50:1 ratio grease pump develops grease pressures up to 7,500psi. Single shot or continuous flow handpiece. Quiet operation. 9611-HS is also available and is suitable for use in underground coal mines. Grease swivels, couplers and extensions.